Guild of One Name Studies stand, WDYTYALive 2016. 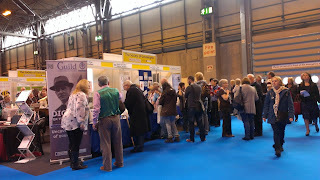 Yesterday I had a quick go round (honest, I only bought a couple of light books and CDs) and after that I was helping at the Guild of One Name Studies stand. It was a busy day, but overall not as crowded as I expected. 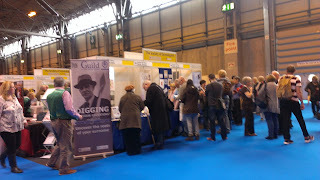 Happily, the Guild had lots of visitors though and we were kept on our toes answering questions, and looking up surnames to check if they were available to register or not. And two members manned the computers to show visitors the spread of their names in the 1881 UK census, and give them a copy of the map generated with Archive Software's Surname Atlas. Many had heard of the Guild but wanted to know more; some were determined already to begin their own surname study. Great to hear! One interesting question that came up twice to me was about specific surname studies begun by someone who had had to abandon them for some reason, perhaps illness. This is one reason I joined the Guild - to have somewhere to 'deposit' my Saggers surname study material so it's not lost 'after I'm gone'.